For a knockout-meets-totally stylish ensemble, choose a Fay double breasted coat and black velvet skinny pants — these pieces play pretty good together. When it comes to shoes, this outfit pairs nicely with black leather loafers. 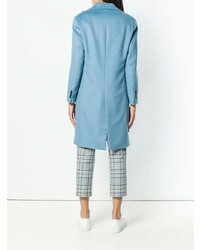 For a casual totally chic getup, dress in a light blue coat and blue skinny pants — these pieces go nicely together. When it comes to shoes, this getup pairs wonderfully with black leather loafers. If you're hunting for a casual yet stylish getup, choose a Fay double breasted coat and blue ripped skinny jeans. Both items are totally comfy and will look fabulous together. White low top sneakers will add a casual vibe to your getup. We're all seeking comfort when it comes to dressing up, and this combination of a light blue coat and light blue ripped boyfriend jeans is an amazing example of that. Got bored with this ensemble? Enter white heeled sandals to jazz things up. 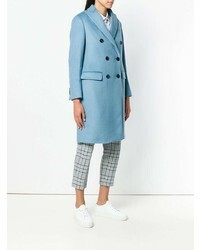 If you're hunting for a casual yet totally stylish getup, marry a Fay double breasted coat with white skinny jeans. Both items are totally comfy and will look fabulous together. For something more on the daring side to complement this ensemble, opt for a pair of white slip-on sneakers. 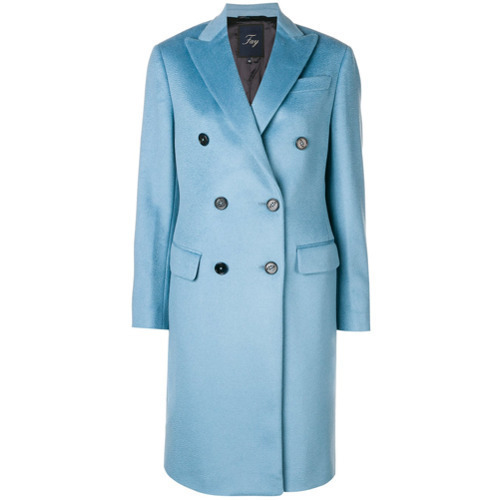 This pairing of a light blue coat and black dress pants is so easy to pull together in no time, helping you look awesome, chic and ready for anything without spending too much time rummaging through your arsenal. With shoes, throw in a pair of aquamarine leather pumps. 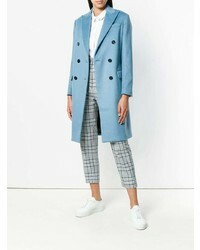 If you feel more confident in comfy clothes, you'll love this chic pairing of a Fay double breasted coat from farfetch.com and grey boyfriend jeans. A cool pair of beige leather pumps is an easy way to upgrade your look. If you're all about comfort dressing when it comes to fashion, you'll love this totally stylish pairing of a light blue coat and light blue ripped boyfriend jeans. You could perhaps get a little creative when it comes to footwear and elevate your look with gold leather pumps. For a neat-meets-totally chic outfit, reach for a Fay double breasted coat and a black bermuda shorts — these two pieces fit beautifully together. A pair of black leather pumps looks very appropriate here.